Fine antique Tehran rugs are one of the most highly respected of all Persian rug styles by connoisseurs and collectors alike because of their incredibly fine craftsmanship and inventive use of exquisitely rendered, primarily botanical and pictorial designs. 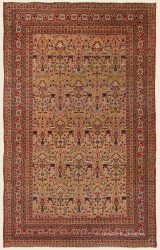 Tehran rugs are not readily known to newcomers because of their small scale of production and very limited supply, with the vast majority of pieces already residing in private collections. 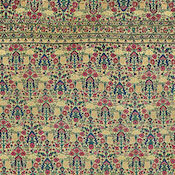 While the best 19th century examples can be unfathomably detailed with a plethora of exotic colors, even works from the first quarter of the 20th century retain their exceptionally fine weave that featured painstakingly drawn designs such as the Mille Fleur, vase designs, and various renditions of the garden design, further contributing to their rare status. The capital of Iran since 1796, Tehran is located at the base of the northern Elburz mountain range bordering the Caspian Sea. 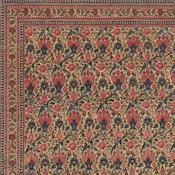 Carpet weaving neighbors include Qazvin, Semnan, and Veramin. Its limited grazing area prevented the proliferation of sheep herding and therefore also curbed carpet production over the centuries. However, two flourishes of increased carpet production occurred during the late 18th century and again in the late 1800s to early 1900s. Click to learn more about this stunning dining room. Tehran carpets are scarce in the marketplace, and, thus, the best examples are highly sought-after collectibles when they are available. 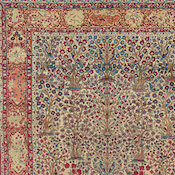 Rug scholars and collectors unequivocally agree that their uncompromising artistry and precision craftsmanship make them peerlessly beautiful, stand-alone pieces. Tehran carpet designs, consistently influenced by other iconic weaving centers, typically exhibit finely rendered curvilinear floral motifs and vinery, and in rare instances capture stunning versions of the classic ‘Garden of Paradise’ design. Viewing one of these gems is a memorable moment indeed, and one that will not fade quickly. 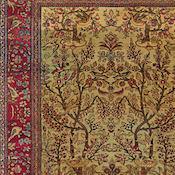 Realistic birds, gazelle, leopards, vases, tree-of-life designs and other remarkable details ornament the weaving throughout. 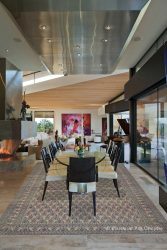 The striking imagery is further enhanced by their effective use of harmonious colors, which would customarily feature a specific shade of violet red, imbuing the rugs with a distinctly luminescent quality. 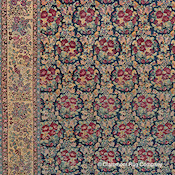 When viewing room size Tehran carpets, one may often encounter various serene and undulating all-over floral patterns, while eschewing the more dramatic large central medallion.  Like many workshop rugs, they were conceived by a master designer who created a cartoon with the actual weaving taken to completion by a team of highly accomplished master craftspeople. 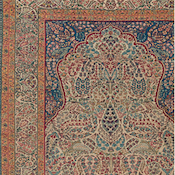 Most Tehran carpets are found in area sizes, however room sizes up to 10×13 and even oversize examples are occasionally seen. Many are distinguished for a construction of a very fine wool, giving them a very lustrous handle and polished appearance. The limited number of highly artistic pieces available at Claremont at any given time is indicative of the very limited supply of well preserved, distinguished Tehran rugs.